I read this article and found it very interesting, thought it might be something for you. The article is called Why Malnutrition Remains A Challenge For India and is located at https://archive.indiaspend.com/sectors/health/why-malnutrition-remains-a-challenge-for-india-56571. India has reduced malnutrition, but it is 13 times worse than Brazil, 9 times worse than China and 3 times worse than South Africa. 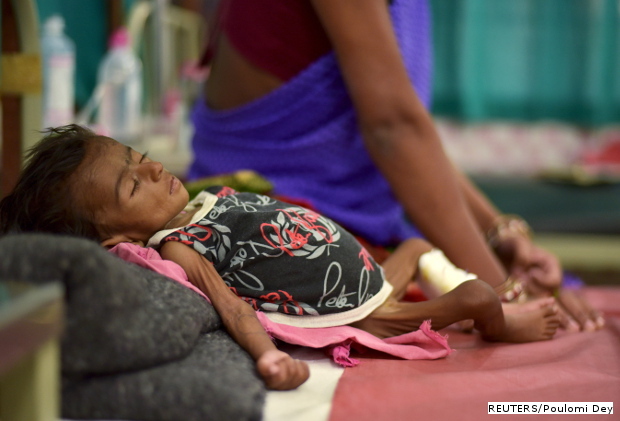 Rural areas have seen more declines in percentages of malnourished children than urban India. The main reasons for the improvement are reduction in open defecation, increase in institutional deliveries and more vitamin A supplements. These are some of the findings of the Rapid Survey of Children (RSOC 2013-14) conducted by United Nations Children’s Fund (UNICEF). While the full report is yet to be made official by the Indian government, The Economist carried extracts from the report. The percentage of underweight Indian children under the age of five is down to 29.4%, according to RSOC data, from 43.5% recorded by the National Family Health Survey, 2005-06. India’s ranking among neighbouring countries has improved, and it is now next to Nepal, which is marginally better off with 29.1% of children under the age of five underweight. When compared to other members of BRICS (Brazil, Russia, China and South Africa), the number of underweight children under the age of five remains dismal, compared to Brazil (2.2%), South Africa (8.7%) and China (3.4%). Yet, RSOC data when compared to the National Family Health Survey 2 (1995-96) and the National Health Survey 3 (2005-06) indicates a clear reduction in the percentage of children identified as malnourished. A child is identified as malnourished based on three criteria; stunted (short for his or her age; technically, at least two standard deviations (SD) below the median height for WHO Child Growth Standards), wasted (short and underweight; or two SD below the median height-weight for the WHO Child Growth Standards) and underweight (two SD below the median weight for the WHO Child Growth Standards). The percentage of stunted children has dropped from 51% in 1999 to 38.7% in 2013-14. Similarly, the percentage of underweight children has come down from 42.7% to 29.4% over the same period. The percentage of children who are wasted was 19.7% in 1999-2000, which then increased to 22.9% in 2006-07. In 2013-14, it declined again to 15.4%. The urban-rural differential continues to be high in all three categories. Rural areas are still doing worse than urban areas in almost every category. However, compared to the data from NFHS 3, RSOC data indicates that the percentage of stunted children fell from 40% in 2006-07 to 32% in 2013-14 in urban areas, while it came down from 51% to 41% in rural areas over the same period. This could be because most public-health efforts are concentrated in rural areas. Despite systemic and systematic discrimination, girls appear to benefit from better nutrition than boys. While 39.5% of boys under the age of five are stunted, only 37.5% of girls are stunted, according to RSOC. The same is true for underweight children: 30% of boys and 28.7% of girls are underweight. Scheduled castes have the highest percentage of stunted children, 42.4%, followed by scheduled tribes at 42.3%. Open defecation is strongly related to malnutrition among young children. Young children in households that use improved toilet facilities are less likely to be stunted, wasted and underweight. The number of people practising open defecation has come down from 55% to 44.8%, an improvement of 10%. Institutional births improved from 40.8% in 2005-06 to 78.6% in 2013. Institutional births ensure pre-natal and neo-natal care for the child and the mother. IndiaSpend had earlier reported how Vitamin A supplements are essential to combat malnutrition. There has been an increase in Vitamin A supplements administered to children under the age of 5 from 25% in 2005-06 to 46% in 2013, according to RSOC data. Uttar Pradesh, Bihar and Jharkhand barely show any improvement. Chhattisgarh and Gujarat, however, reported improvement of 9% and 8%, respectively. Odisha has seen an improvement of 5%, followed by Tamil Nadu. Andhra Pradesh has seen an increase of 5% in wasted children. All the worst five states have seen a decline in underweight children. The highest decline in percentage of underweight children was seen in Madhya Pradesh, with almost 21%, followed by Bihar with 17%.